A study was conducted to evaluate the levaquin us efficacy of Speman..
ADK is a partner with the Leave No Trace Center for Outdoor Ethics. Leave No Trace is a national and international program designed to assist outdoor enthusiasts with their decisions about how to reduce their impacts when they hike, camp, picnic, snowshoe, run, bike, hunt, paddle, ride horses, fish, ski, or climb. The program strives to educate all those who enjoy the outdoors about the nature of their recreational impacts as well as techniques to prevent and minimize such impacts. Leave No Trace is best understood as an educational and ethical program, not as a set of rules and regulations. See LNT Master Educator, Trainer and Awareness Workshops. Leave No Trace Seven principles were developed in cooperation with the U.S. Forest Service, National Park Service, Bureau of Land Management, and U.S. Fish and Wildlife Service. Know the regulations and special considerations for the area you’ll be visiting. Always leave your itinerary with someone at home. Travel in small groups to minimize impacts. Hike in the middle of the trail; walk through (not around) puddles/mud. Stay off of vegetation; walk on rocks where possible. Camp in designated sites where possible. In other areas, don’t camp within 150 feet of water, trail, or a road. Pack out all trash (including toilet paper), leftover food, and litter. Use existing privies, or dig a 6-8 inch deep cathole at least 150 feet from water. Wash yourself and dishes at least 150 feet from water. If needed, use only small amounts of biodegradable soap. Let photos, drawings, or journals help capture your memories. Use a portable stove to avoid the lasting impact of a fire. Where fires are permitted, use existing fire rings and collect only downed wood. Avoid wildlife during mating, nesting, and other sensitive times. Control pets at all times, and clean up after them. Let natural sounds prevail; avoid loud sounds and voices. Be courteous and yield to other users; take breaks to one side of the trail. Leave No Trace in the Adirondacks: Part of planning ahead and preparing is knowing the regulations and specific environmental concerns for the area you are visiting. Please visit our Hiking in the Adirondacks page for more information. 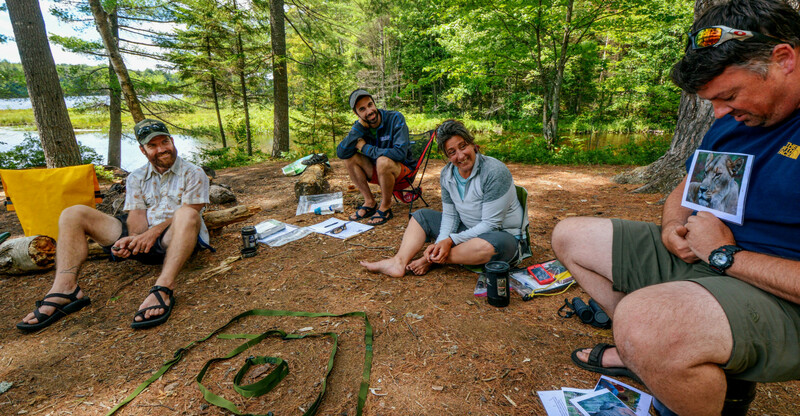 ADK is one of ten national providers of Leave No Trace Master Educator courses. ADK also provides Leave No Trace Trainer courses, as well as offering Leave No Trace Awareness Workshops. Master Educator courses are typically five days in length and designed for people who are actively teaching others backcountry skills or providing recreation information to the public. Trainer courses provide introductory training in Leave No Trace skills and ethics in a condensed two-day format. Awareness Workshops include any formal Leave No Trace presentation that is one day or less in length. All of ADK’s guided trips adhere to these principles, providing another great opportunity to learn about Leave No Trace. If you are interested in a Leave No Trace Master Educator Course fill out this application.